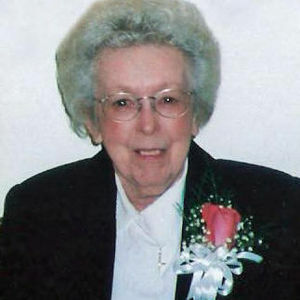 Erna Lundgren, 90, Wahpeton, ND, passed away Monday, January 7, 2013 at St. Catherine's Living Center, Wahpeton ND. The funeral service will be held at 11:00 a.m. on Friday, January 11 at Immanuel Lutheran Church, Wahpeton with The Rev. Morris Stephens officiating. Interment will be at Fairview Memorial Gardens, Wahpeton. Visitation will be held from 5:00 p.m. to 7:00 p.m. Thursday, January 10 at Willow Creek Chapel with a prayer service at 7:00 p.m. Erna Ann Doerr was born February 24, 1922 at Brownton, Minnesota to Elsie (Albrecht) and Arthur Doerr. She was baptized and confirmed in the Lutheran Faith at Immanuel Lutheran Church, Brownton, Minnesota. She attended Lutheran Elementary School and Brownton High School graduating in 1940. She was united in marriage to Verlin Lundgren on July 5, 1941. They made their home in Minneapolis, Minnesota until Verlin was called into military service in 1944. Erna, along with son Warren, followed Verlin to his many duty stations. She returned to Brownton living there while Verlin was overseas, and for several years after with Verlin when he returned from service. She and Verlin then started their own electrical and appliance business at Frederic, Wisconsin where she ran the office and store part of the business until 1954. They moved to Wahpeton when Verlin accepted a position as Electrical Instructor at NDSCS. Erna was a stay-at-home mother until she began employment as secretary at the Wahpeton Central Elementary and Junior High School from 1965 to 1984 which she enjoyed very much. She is fondly remembered by many former students for her smile and caring way. After her retirement, she organized office procedures for Richland- Wilkin County United Way from1985 to 1986. Erna was an active member of Immanuel Lutheran Church, Wahpeton singing in the church choir, serving as Sunday School teacher, Secretary of the Church Council for several terms, and holding offices in Lutheran Women's Missionary League. She was president of NDSCS Faculty Wives, active in Cub and Girls Scouts, and was Historian for Hafner Miller Ross Post 20 of the American Legion Auxiliary. Erna was also active in the Arthritis Support group, Friends of the Leach Library and a member of the Wahpeton Homemakers since 1954. Erna enjoyed fishing and spending time at the lake first at the resort owned by her and Verlin and later at their summer cabins. Until her arthritis made these activities impossible, she loved to crochet and to golf. Erna was a wonderful cook whether making lavish holiday meals served on china or her stand-by meal of corn chip hotdish with whipped jello. Blessed to have shared her life are her husband of 71 years, Verlin, son Warrren, Hibbing, MN, son Glenn (Andrea), Aurora, IL, daughter Lynn (Scott) Rerick, Ashley, ND, ten grandchildren: Scott, Kimberly, Sarah, Deborah, Shelly, Amanda, Michael, Mark, Jeffrey, and Elizabeth, and twelve great-grandchildren. She was preceded in death by her parents, two brothers (Edward and Herbert), a sister (Eleanora), and a great-grandson Ryan Lundgren. Vertin-Munson Funeral Home in Wahpeton is in charge of the arrangements. The beautiful and interactive Eternal Tribute tells Erna's life story the way it deserves to be told in words, pictures and video. Lynn I'd like you to know that your mother was one to give me, & I'm sure many other kids that passed thru the halls of Central, a break when we were late, were goofing around, or just trying to be kids, as you know, trying to dodge trouble in those days was no easy matter. I would like to think that our class was special because she was a big part of it, but your mother surely gave to all the best that was humanly possible to give. She is truly one of the unforgetable persons that I had had the priviledge to have been associated with. Verlin, Warren and the rest of my family. You have my deepest sympathy and condolences. I remember her as the niceest lady on my paper route. My condolences to the family. Lundgren Family, I have great memories of Erna as the Secretary at Wahpeton Central Jr. High. How she ever put up with all of us rambunctious kids in that school...I'll never know. She always had a smile on her face and was so helpful. God bless the memory of Erna Lundgren.